What is Schiff Move Free Advanced Plus MSM & Vitamin D? 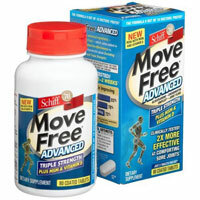 Schiff Move Free Advanced is a joint supplement from Schiff which also makes Schiff Glucosamine Plus MSM. Schiff Move Free Advanced has all the ingredients that joint supplements have been using for years now. It also has Chinese Skullcap and Black Catechu as inflammation modulators. Schiff Move Free Advanced has titanium dioxide. Glucosamine Uses 1500mg of glucosamine HCl. Glucosamine is a precursor to glycosaminoglycans which are a major component of joint cartilage. Chondroitin Sulfate Has 200mg of chondroitin sulfate. Chondroitin makes up glycosaminoglycans which are a component of cartilage. Methylsulfonylmethane (MSM) Has 1500mg of MSM, more than average amount. MSM is a source of sulfur for protein and connective tissue synthesis. Hyaluronic Acid Has 3.3mg of hyaluronic acid, a very low amount. Hyaluronic acid is a vital fluid found in the synovial (joint-lubricating) fluid. If Titanium Oxide is detrimental to one’s health, why is it permitted to be sold to consumers? I agree ,how can you sell this product with a health hazard.I would not buy it. I did not realize that titanium oxide was so bad for you or I would not have bought this item and spent $17 on it. I have bilateral chondromalacia which becomes inflamed when I do a lot of stair-climbing. After returning from an 8 day mission trip, where I was going up and down nearly 400 steps a day, I could barely walk. Three weeks after my return, despite a complete cessation of exercise, I still could not take a single step without severe pain in both knees. I bought Schiff Move Free Advanced Triple Strength and began the regimen on March 26th. I was very lucky – I felt relief in less than 24 hours. Within 4 days, my right knee was pain free and the pain in my left knee was fairly minimal. After a week, I was pain free in both knees except when I was going up or down stairs. This medication was a miracle for me. I did exactly what I should not have done — I bought it and THEN googled it. I didn’t see this review until I had been taking the medication for a few days…at that point, I knew it worked for me and continued to take it. I was able to stop taking it after two weeks – my last dose was a couple of days ago, and so far so good. But I am keeping the bottle! I just finished a bottle o move free ultra I don’move any freer than before i took it. coffee or tea to liquefy it. This is a good product.